Located on the waterfront in 18th century Christiansted, Caravelle Hotel & Casino faces the harbor with eastward views of Protestant Cay, Christiansvaern Fort and the old French fort site, and westward views of the outmost point of the Judith’s Fancy neighborhood wherein lies the entrance to Salt River (the location of Columbus’s landing). Northward, when conditions are right, profiles of the other US and British islands show on the horizon. The Caravelle Hotel & Casino property, host to more than a half-million visitors to date, is a charming complex of gift, souvenir and clothing shops, offices, and several restaurants. The flagship waterfront restaurant has had its fair share of the fabulous and famous. From musicians, to politicians, athletes to thespians, the beautiful views and refreshing breezes, coupled with great food, icy-cold drinks and warm hospitality have drawn raves from Mel Fisher, Cliff Robinson, Lee Greenwood, Tim Duncan, Lisa Marie Presley, Priscilla Presley, Orlando Wilson, Donavan Leech, Dave Mason, Rita Marley, Gary Morris, David Copperfield, Alexis Smith, Spencer Christian, Loretta Swift, Geraldine Ferraro, Maureen OHara and many others. 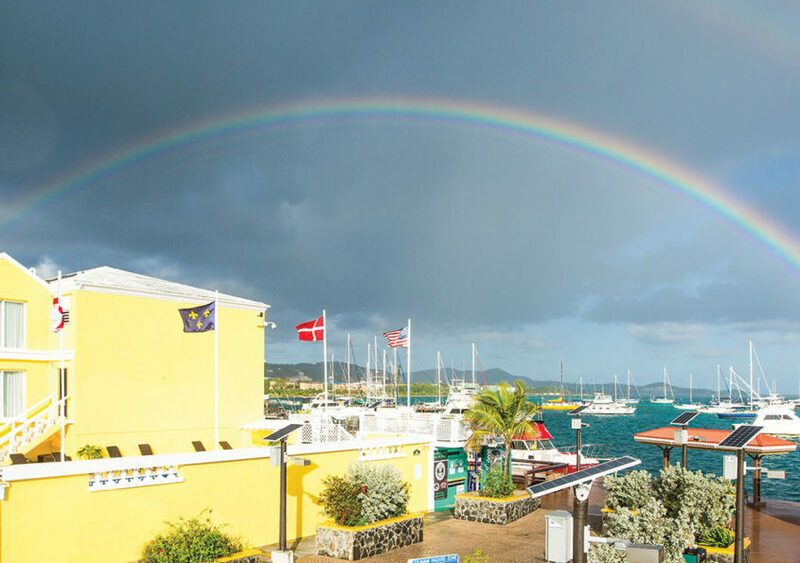 Danish visitors to St. Croix particularly love staying at Caravelle Hotel both for its historical roots and its friendly staff. Travelers from Denmark return time and again to learn about this slice of paradise so closely connected to their country. Americans make up for more than 90% of the island’s visitors and they too, return for the charm, history and warm hospitality. Located on the property are several gift shops, watersports, a cafe, SCUBA, and several other retailers. RumRunners is a festive Caribbean restaurant located on the waterfront in downtown Christiansted. Voted People’s Choice Best Restaurant several years running, our kitchen offers both Caribbean and Continental cuisine seven days a week for breakfast, lunch, and dinner. Don’t miss Rum Runners’ Sunday brunch from 10am to 2pm. Choose your own live lobster from the salt water tank. Visit Rum Runners’ tropical bar for cooling island cocktails and ice-cold beers. Happy Hour at RumRunners’ Deck Bar is a wonderful place to unwind and enjoy cool Caribbean cocktails and tropical appetizers. Don’t miss the Tarpon feeding at sunset every night.